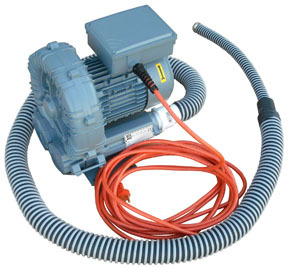 The CB-152 Cooling Vacuum utilizes a regenerative ring compressor for long life and quiet operation. This cooling vacuum is intended for use with the Labworks ET-132, ET-126, ET-139, and ET-140 shakers and the MT-160, MT-161 and MT-163 Modal Thrusters operating at high force and long test durations. Dimensions 11 x 9.5 x 11 in.